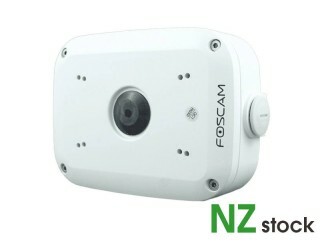 -Foscam PoE Splitter POE5912G -Color: Black With cost-saving and power management feature, Foscam POE5912G is the 10/100Mbps Power over Ethernet splitter which is ideal for quick PoE environment deployment. 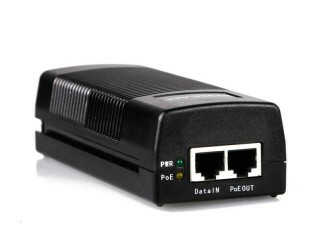 The POE5912G can split PoE-powered RJ45 cable into 12V/9V/5V DC Direct Current to where there are no power line or outlet, where you wish to fix device such as AP, IP Camera or IP Phone, etc.. Working with the IEEE 802.3af power source equipment (PSE), the POE-5912G frees the device deployment from restrictions of power outlet locations, which eliminates the costs for additional AC wiring and the installation time. 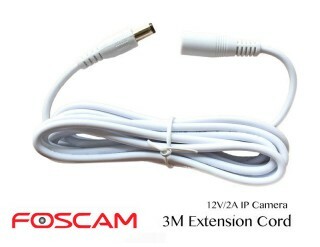 FEATURES: -Power Over..
Extension Cord (22WAG, 3 meters) WHITE for Foscam 12-Volt IP Cameras-Color: White2.1mm x 5.5mm DC extension cord for power adapter.Male: 2.1mm (inner dia.) x 5.5mm (outer dia.) plug, Female: Accepts 2.1mm x 5.5mm plugThis cable will only work with power adapter with 2.1mm x 5.5mm plug and not other sizes.Extend your camera's regular DC power supply to up to 4 meters in total! 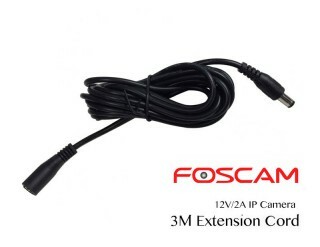 This power supply extension cord works for all Foscam cameras running on 12-Volt power.This cable supports and is not limited to the following.Foscam models FI8919, FI8602W, FI8620, FI9801, FI9802, FI9804, FI9805, FI9803, FI9903 and FI9828 are supported as they are runni..
Extension Cord (22WAG, 3 meters) Black for Foscam 12-Volt IP CamerasColor: Black2.1mm x 5.5mm DC extension cord for power adapter.Male: 2.1mm (inner dia.) x 5.5mm (outer dia.) plug, Female: Accepts 2.1mm x 5.5mm plugThis cable will only work with power adapter with 2.1mm x 5.5mm plug and not other sizes.Extend your camera's regular DC power supply to up to 4 meters in total! 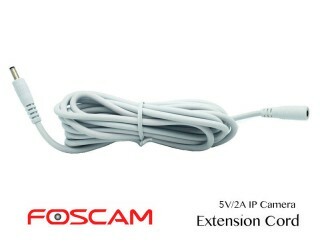 This power supply extension cord works for all Foscam cameras running on 12-Volt power.This cable supports and is not limited to the following.Foscam models FI8919, FI8602W, FI8620, FI9801, FI9802, FI9804, FI9805, FI9803, FI9903 and FI9828 are supported as they are runnin..
Extension Cord (20 WAG, 2 meters) white for Foscam 5-Volt IP Cameras2m Extension Cable1.3mm x 3.5mm DC extension cord for power adapter, blackMale: 1.3mm (inner dia.) x 3.5mm (outer dia.) plug, Female: Accepts 1.3mm x 3.5mm plugThis cable will only work with power adapter with 1.3mm x 3.5mm plug and not other sizes.Extend your camera's regular DC power supply to up to 3 meters in total! 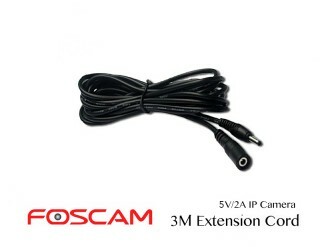 This power supply extension cord works for all Foscam cameras running on 5-Volt power,including but not limited to the following:FI8905, FI8906, FI8910W, FI8910E, FI8918W, FI9831W, FI9831P, FI9821W, FI9821P,FI9826, I9816P, R2, R4 ...***Foscam outdoor mode..
Extension Cord (20 WAG, 2 meters) Black for Foscam 5-Volt IP Cameras2m Extension Cable-Black1.3mm x 3.5mm DC extension cord for power adapter, blackMale: 1.3mm (inner dia.) x 3.5mm (outer dia.) plug, Female: Accepts 1.3mm x 3.5mm plugThis cable will only work with power adapter with 1.3mm x 3.5mm plug and not other sizes.Extend your camera's regular DC power supply to up to 3 meters in total! 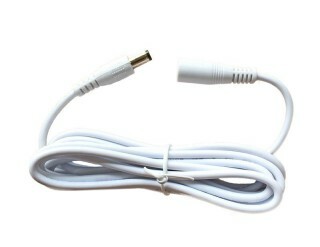 This power supply extension cord works for all Foscam cameras running on 5-Volt power,including but not limited to the following:FI8905, FI8906, FI8910W, FI8910E, FI8918W, FI9831W, FI9831P, FI9821W, FI9821P, Fosbaby,I9816P, FI9826P, R2, R4 ***Foscam..
Extension Cord (20 WAG, 3 meters) Black for Foscam 5-Volt IP Cameras3m Extension Cable-Black1.3mm x 3.5mm DC extension cord for power adapter, blackMale: 1.3mm (inner dia.) x 3.5mm (outer dia.) 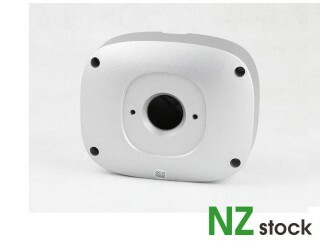 plug, Female: Accepts 1.3mm x 3.5mm plugThis cable will only work with power adapter with 1.3mm x 3.5mm plug and not other sizes.Extend your camera's regular DC power supply to up to 4 meters in total! 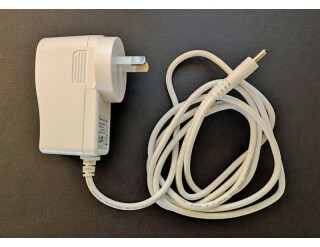 This power supply extension cord works for all Foscam cameras running on 5-Volt power,including but not limited to the following:FI8905, FI8906, FI8910W, FI8910E, FI8918W, FI9831W, FI9831P, FI9821W, FI9821P, Fosbaby,I9816P, FI9826P, R2, R4***Foscam .. 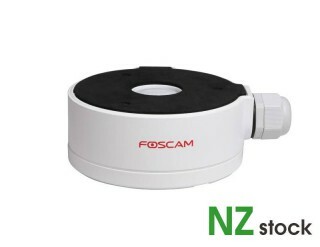 The Foscam PSE15 POE Injector is able to supply power to a POE Enabled IP Camera or POE Splitter over the ethernet cable. 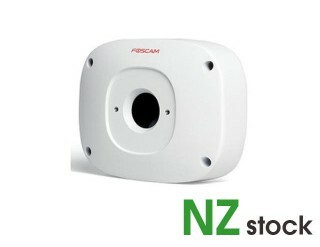 Use the PSE15 Injector if you want to get power to an IP camera using your existing non-poe switch or router.Advantages to using POE when installing your IP Security Cameras.-You don't need a Power Point near the camera location, the power comes over the ethernet cable.-No wi-fi hassles, plug it in and it just works!PSE15 POE Injector is compatible with all Foscam IP CamerasNo extra equipment is required for POE ENABLED cameras. 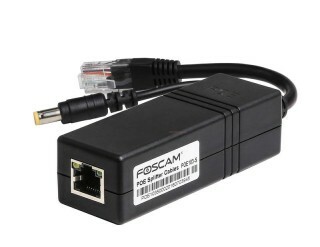 Just run the ethernet cable from the injector straight to the camera.If the camera is not poe e..
-Foscam PoE Splitter PD 103s -Color: Black With cost-saving and power management feature, Foscam POE103 is the 10/100Mbps Power over Ethernet splitter which is ideal for quick PoE environment deployment. 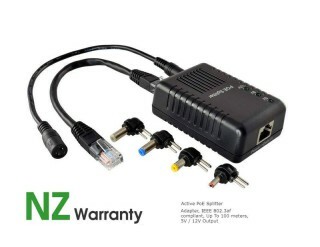 The POE103 can split PoE-powered RJ45 cable into 12V DC Direct Current to where there are no power line or outlet, where you wish to fix device such as AP, IP Camera or IP Phone, etc.. Working with the IEEE 802.3af power source equipment (PSE), the POE-103 frees the device deployment from restrictions of power outlet locations, which eliminates the costs for additional AC wiring and the installation time. 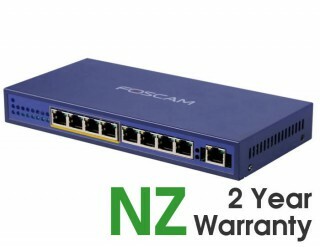 FEATURES: -Power Over Ethernet: Fu..